Who can use this Introducer Agreement Template (Introducer Commission)? 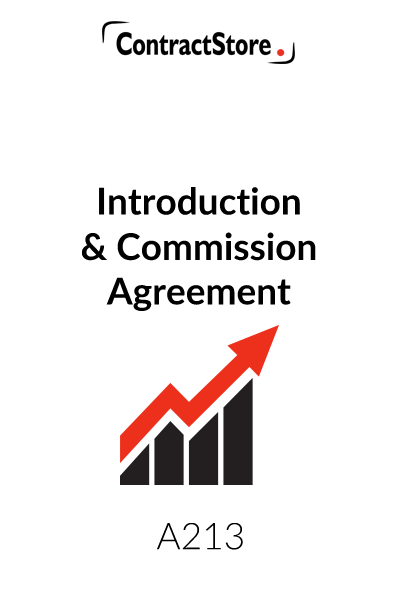 Any two businesses can use this introduction commission agreement, whether they are sole traders or larger organisations or a mixture of the two. It is suitable for a range of businesses – from a wedding planner who introduces a florist to her clients to a carpenter who introduces a decorator to his clients – and vice versa in each case. 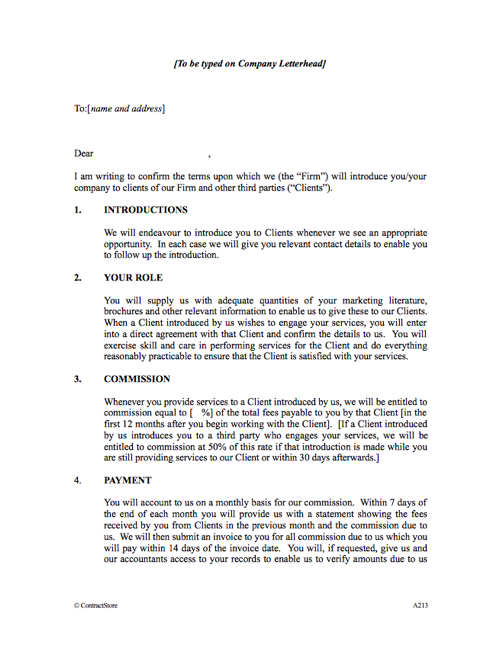 What is this Introducer Agreement Template for? It is designed for use where one business agrees to introduce another business to its customers or clients in return for commission. The agreement identifies the basis for introductions, commission and payment terms, etc. The agreement is prepared in the form of a letter prepared on the headed notepaper of the company offering to make introductions. Roles of parties. One will arrange introductions of certain types of clients or contacts to the other. This may involve one party providing the other with marketing literature. Financial. Introductions which are successful will result in a commission payment to the introducer. Calculation and payment terms need to be set out. Duration. The agreement should say when it starts and ends and what happens to introductions that become fruitful after the agreement ends. Good faith and other terms designed to ensure a collaborative approach can usefully be included. Confidentiality is also important. You may also need to consider Data Protection Act implications. 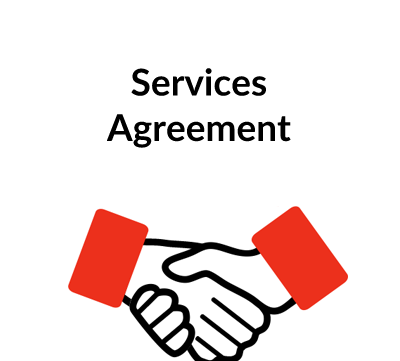 This agreement is designed for use where one business agrees to introduce another business to its customers or clients in return for commission. The contract sets out the basis for introductions, commission and payment terms, confidentiality, good faith and other terms. The agreement is suitable for a wide range of businesses – e.g. a wedding planner who introduces a florist to her clients or a carpenter who introduces a decorator to his clients – and vice versa in each case! This is very short and merely states that the introducer (referred to as the Firm) will provide introductions when it considers there is an appropriate opportunity. Incidentally, the Data Protection Act may be relevant here and the firm should consider the implications of this legislation. The party to whom the letter is written (referred to in these Notes as the service provider) will supply the introducer with brochures etc. and agrees with the introducer to perform his services so as to satisfy the client. The introducer wants this assurance for his own benefit. This paragraph also makes it clear that the service provider will have to have his own contract with the client – the introducer does not get involved in the service provider’s contractual arrangements. This sets out the percentage due to the introducer out of fees earned by the service provider. 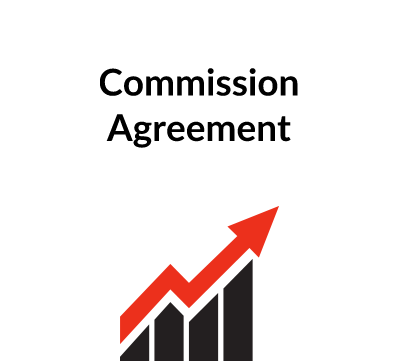 If the commission is a fixed fee, the wording needs to be adjusted. Also, we have some optional wording in square brackets that limits the commission arrangement to a 12 month period and wording that allows third party introductions to generate commission. These should be removed or altered as appropriate. This assumes a monthly statement will be sent to the introducer who will then raise an invoice to be paid by the service provider within a specified period – 14 days is suggested here. The introducer has the right to check the service provider’s accounts to verify the commission payments and to claim interest if a payment is not made on time. Our clause proposes interest at the statutory rate: in the UK, if the contract does not specify an interest rate, the law allows an unpaid party to a contract to claim a high rate – 8 per cent above Base Rate under the Late Payment of Commercial Debts (Interest) Act. The agreement is an open-ended one with each party being able to terminate it on 30 days notice, but commission will continue to be paid for an agreed period after termination. This is needed to protect the introducer from losing commission if the agreement is terminated by the service provider just after he has been given a valuable introduction. This imposes strict confidentiality obligations on the service provider. Both parties agree to act in good faith and, in particular, the service provider is under a duty not to do anything that might be detrimental to the introducer. This gives the option for the service provider to be paid commission by the introducer if he gives business to the introducer. The paragraph should be removed if it not appropriate but, if it is retained, it could be expanded to spell out the commission arrangements, which might be the same for both sides, if agreed. This makes it clear that the parties are independent of each other and neither party can make commitments on the other’s behalf. Consent is required before the service provider can assign or sublet any of his rights or obligations to a third party. The introducer has the right to terminate at any time if the service provider commits a breach of the terms or becomes insolvent. Here, the service provider gives an indemnity to the introducer – i.e. agrees to make good all loss suffered by the introducer as a result of his default. The introducer makes it clear in this paragraph that he is not giving any guarantee as to the creditworthiness of any client introduced to the service provider, nor that any introductions will result from the agreement. There is also a statement that the agreement is on a non-exclusive basis – i.e. the introducer could have similar agreements with competitors of the service provider. If exclusivity is part of the deal, this wording should be changed. Any notice under the agreement has to be in writing. 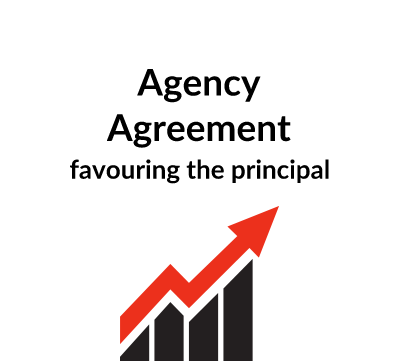 The agreement provides for a three-stage process for dealing with any dispute that arises – direct negotiation, mediation and then the courts. Our form says English law will apply, but this can be changed as appropriate. We have free information on our website that deals with these issues: Z139 and Z140. Once the wording is finalised, two copies of the letter should be signed and sent by the introducer to the service provider who should return one copy, countersigned and dated as indicated.